This bundle contains 3 frameworks to developing and defining your company's strategy. 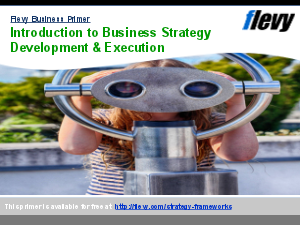 The first document, Strategy Development Methodology, dissects the concept of strategy development into its elements and discusses the history of strategy development. Creative Thinking in Strategy Development delves in the strategy development process and shows how to inject creative thinking into strategy development. This is important, because creativity is essential for strategy development, but creativity itself is cannot be forced. The third document, Scenario Planning, discusses a powerful tool for Strategy Development. It describes a 9-phase approach that has been developed and used by top management consulting firms.